Note: We are in the process of adding Microsoft To-Do to Exchange Online subscriptions. This will finish in March. 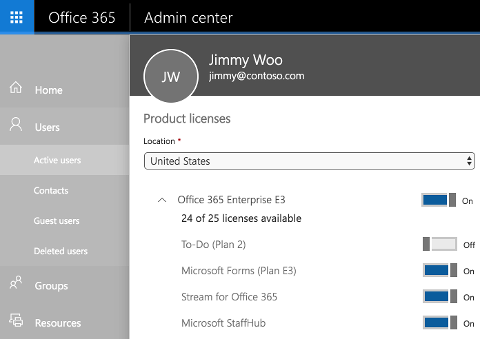 Customers with one or more eligible Office 365 subscriptions listed above will see user-level licenses for Microsoft To-Do. You can use these licenses to manage individual access to the Microsoft To-Do apps for Windows, iOS and Android, as well as control visibility of the Microsoft To-Do tile in the Microsoft 365 app launcher. To assign or disable a user's license for Microsoft To-Do, please visit the 'Users' page of the Office 365 Admin Center and select that user, then selecting your preference for To-Do and clicking save. If users who don’t have a license for any of the Office suites listed above or have a disabled Microsoft To-Do license log in to Microsoft To-Do for Windows, iOS or Android, they will receive an error and be logged out by the app. Note: We are in the process of adding making To-Do on the web a part of Outlook on the Web, which is licensed through Exchange Online. This means users will no longer need an enabled To-Do license in order to launch or use To-Do on the web. Please review our article on managing access To-Do on the web if you wish to learn more.